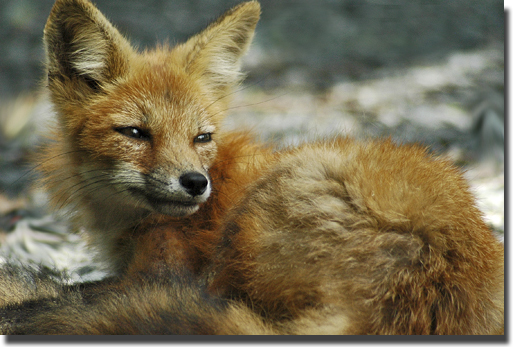 Yesterday I was in Blowing Rock near the golf course and saw two red foxes taking naps. Apparently these foxes are quite used to humans and allowed me to get close enough to get many, many shots. It seems to me that a fox is almost a perfect combination of a dog and cat. Several years ago I took photos of a litter of fox in the den of a field while the mother was off hunting food. I returned the next day to find that a farmer had spread lime in and around the den. I don't know the fate of the litter--but they were not there any more. I wish this pair much more luck.